Banded Demoiselle (male), River Ribble. SUMMER IS ALMOST HERE NOW and most birds are settled down to breed, in fact some have almost finished. Today's first prize went to a red male Common Crossbill over Gannow Fell calling this morning, no sight or sound of the cuckoos from Saturday though. A male stonechat was also here alongside the noisy curlews and a singing reed bunting. I'm hoping for a raptor or two from this great vantage point, we will see. Stocks was quiet again with only the drake wigeon on the island of note. Two Red-breasted Mergansers were loafing around in the Hodder Inlet, which looks great for shorebirds now the water level has dropped. The cuckoo opposite the hides was still singing early this morning but there was not much else happening. Alston Wetland also looks great and a new Common Ringed Plover showed that there might still be time for something interesting before the return passage starts later next month. A pair of redshanks have two chicks now and the Gadwall flock reached 18 today. 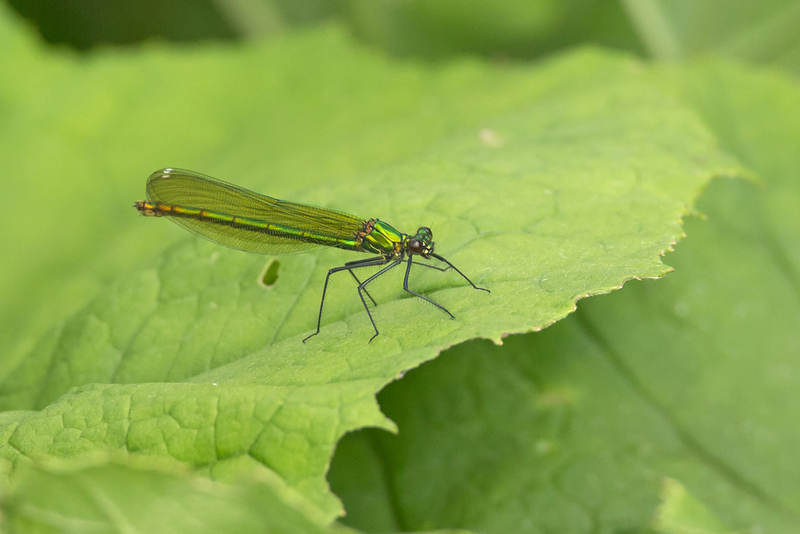 I love walking along the riverbank of the Ribble and in one of my favourite spots there are a lot of Banded Demoiselles at the moment, I also saw a Gadwall actually on the river, the first time I've seen one here. A grumpy Goosander growled at me as it took off, a buzzard and a sparrowhawk flew over, a redshank was on the riverbank and a Linnet was singing from a nearby small ash tree (they are a summer migrant in East Lancs!) on a beautiful sunny day with fluffy white polar maritime clouds across the sky. Wonderful! Banded Demoiselle (female), Ribble Valley. Super wren belting out its song at Alston.